It is year since the Designer Crafts Blog Connection began. What a year! Each month a fresh challenge, great give aways and generous manufacturers who have supplied us with product to use and review. A sincere thank you to our sponsoring companies and to our creative leader Julie McGuffee! Julie has posted many pictures from the show which was wonderful as I was exhibiting in the L+D section of the show and didn't get many photos. This month we have returned from CHA, the Craft & Hobby Association's Trade show. Each year attendees from all the world, editors, publishers, manufacturers, celebrities and retailers come together to present and shop the best and newest creative products and techniques. The Innovation Showcase and Awards highlights the newest products in the industry. The winner was Shoe Attitude, tattoos for shoes. Runners up were Cool2Cast and the Knook the knitting needle crochet hook from Leisure Arts. 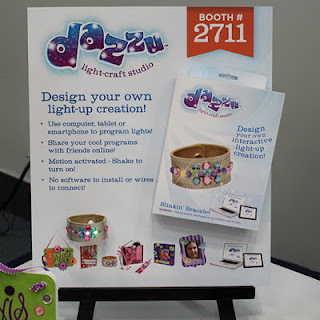 I thought the kids LED light, sticker kits by Dazzu were very cool and Baby Boutique, diaper covers and accessories for the eco-conscious mom were cute and so smart! 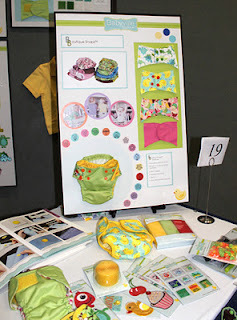 The fashion finds at the show were very creative especially the Ilovetocreate booth where EcoHeidi took broken cups and saucers and fashioned a brilliant colorful skirt. Because of my areas of interest especially in felt and needle felting I was so pleased to see several felt companies at the show. EKSuccess who now has the Dimensions Brand introduced a series of adorable animal kits which include a silicone mold in the larger kits. A new Canadian company Pollika had a collection of 100 percent wools, rovings and Wope, a wool rope with the added strength of jute included. Kunin's ecofelt showed bright patterns and tapestry inspired designs, felt has come a long way! The New Image Group had a beautiful felt purse line with a collection of embellishments to personalize your bag your way. Texture and iconic elements were very evident at the show, birds, wings, dress forms, travel, body, shoe, clothing tattoo art. 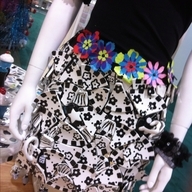 Fabric and felt elements were found incorporated into paper, mixed media designs.